Wheelcraft has full in house wheel refurbishment facility in Sleaford, near Skegness. We can offer full refurbishment of alloy wheels returning them back to showroom condition. Even if you have bent a wheel out of shape this may be fixed through refurbishment services. All of this is a massive saving on the alternative of replacement. Are your wheels showing signs of their age with blemishes, scuffs, chips, brake dust pitting, scratches or discolouration? Could your car be devalued by shabby looking alloy wheels? Would you like to give your car a makeover with a refurbishment, new colour or finish alloy wheel in Sleaford? Have you suffered at the hands of British roads and damaged a wheel and need a repair? 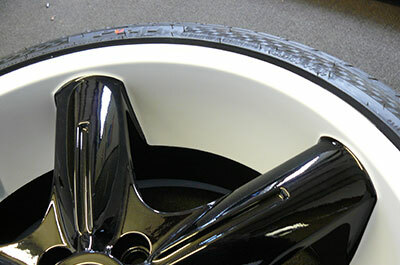 If the answer is yes then we can help you transform your old wheels back to showroom condition. Do you remove unsightly kerb damage in the refurbishment process: scrapes, scuffs and scratches? All kerb damage is removed by hand or using our machines in our Sleaford facility depending on its severity. Yes, tyres are removed, the wheels are bead blasted to back to alloy, repaired if necessary and repainted through a multiple paint application process. We have a range of colours which will closely match your original paint colour at no extra cost. Colour Coded match is available for an additional cost. The process varies dependent upon the finish and condition of the wheels, typical lead times are: Refurbish only - 5 working days in our Sleaford base; Refurbish and repair - 6 working days with us. Yes, we have a full tyre sales and fitting service in Sleaford and can offer a range of tyres at highly competitive trade prices. Yes, in some cases we can supply ‘slave’ wheels for you to use while the refurbishment is taking place. A deposit may be required.